Where do I use my Lookfantastic voucher code? Follow our link to the Lookfantastic website and browse for your goods. Add your goods to the basket. Once you’re finished shopping head to the checkout. On this page paste your promo code into the ‘discount code’ box beneath your order and click 'Add’. Click 'checkout now' to complete your purchase. Lookfantastic is the award-winning online British beauty boutique, bringing you fabulous deals on premium hair and beauty products with free standard UK delivery and huge savings on high street prices. Lookfantastic have everything you need to feel your best from your toes to the tip of your hair, with shampoos, conditioners, treatments and colours to give yourself luscious locks and all the styling products like sprays, hair straighteners and curlers to whip up the look you love. At Lookfantastic you’ll find great deals on makeup, cosmetics and nail care, plus plenty of lovely fragrances to really help you make an impression. Look after yourself with healthy supplements and treat your home to scented fragrances, all available with great discounts thanks to our Lookfantastic voucher codes. Lookfantastic stock all the top brands like GHD, Dermalogica, Elemis, Elizabeth Arden, Decleor and many, much more and with great deals like free standard UK delivery, you can enjoy looking and feeling your best for less. Head straight to us for your code for Lookfantastic and start saving money on all the beauty products you could ever need like haircare, makeup and skincare! Discover the most opulent beauty products made with innovative ingredients from the most luxurious on-trend brands. Worth over £60, and with 6 premium beauty treats included, discover the Lookfantastic beauty box, subscription options start from only £13. The Lookfantastic Beauty Box subscription can be either 1, 3, 6 or 12 months long, all with FREE delivery! With the beauty box from Lookfantastic each month you can discover a host of beauty treats from some of the best brands around. Worth over £50, you're guaranteed to fall in love with something new every time you receive your box. Discover the incredible offers in the Lookfantastic Sale. With huge discounts on the top beauty brands like GHD, Molton Brown, Foreo and Omorovicza, as well as exclusive sets and multi-buy options on many more, you're certain to find the perfect beauty products to make you look and feel fantastic this new year. In the sale at Lookfantastic, you can grab savings on everything including hair, makeup, face products and body-care, men's products, electrical items, fragrance, Dermalogica and GHD. If you can't find anything you fancy in the sale you can always check out our voucher codes and grab a bargain on beauty products at Lookfantastic. If you are in a hurry, you can opt to pay £3.99 for standard next day delivery. Order before 11pm 7 days a week. There are no deliveries on bank holidays. This service is free for orders of £100 or more. Next day evening delivery costs £8.99, Deliveries arrive between 6pm and 10pm 7 days a week, excluding bank holidays. Same day delivery is possible for £8.50 if your order is placed before 11am, excluding bank holidays. Exclusions may apply to these services. How can I be sure that my personal details are safe if I open an account? What is the Lookfantastic Beauty Box? This is a global luxury subscription service. The box arrives each month to your doorstep, featuring 6 beauty products from a wide variety of brands. You can subscribe for just 1 month, 3, 6 or 12 months. Lookfantastic is Europe's number one online British Beauty Boutique and the ultimate destination for everything hair, beauty, skincare and all things gorgeous. Featuring over 14,000 products, Lookfantastic supply some of the leading luxury beauty and hair brands such as Estee Lauder, GHD, Dermalogica, Redken, Lancôme, Origins, Kérastase, REN, Benefit, Elemis and many more. find everything from Nail Care to Fragrance all beauty products alike in between; there is something for everybody. Use a Lookfantastic voucher code at the checkout and save on a wide range of beauty products. 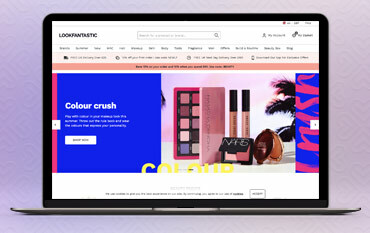 With a dedicated team of beauty experts who receive regular training directly from brands, lookfantastic.com provides accurate and intelligent information on everything they sell so you can always trust and rely on Lookfantastic for the best advice and information. We are constantly on the hunt for first order Discount Codes for Lookfantastic to help you with your money saving. Our experts check dozens of sites for secret codes including NHS discounts, student sites & social media channels saving you time & money!